Not too many movies open up in October—and only one studio horror flick at that, despite Halloween. What’s the best way to sell tickets then? Star power. Celebrity faces are going to be starring back at you from every single marquee across the nation with dead eyes and Photoshopped smiles. Are you ready? 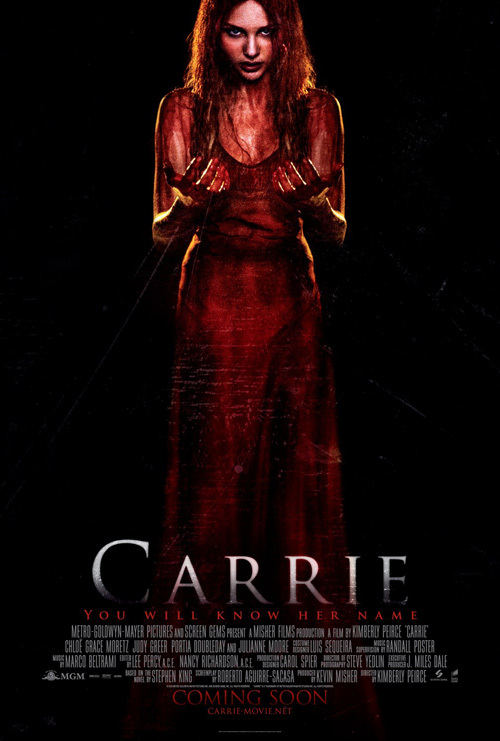 We begin with that one horror film—the Carrie (open October 18) remake. It’s no surprise ARSONAL would decide to go full-force with the bloody, terrifying incarnation of the high schooler for their campaign since those who know the original won’t be spoiled and those who don’t need the gore to get them in the theater. Say hello to the text over face trope, shudder at star Chloë Grace Moretz’s telepathically-inclined ambivalence, and wonder whether or not that blood was simply red watercolor paint splattered onto her face. 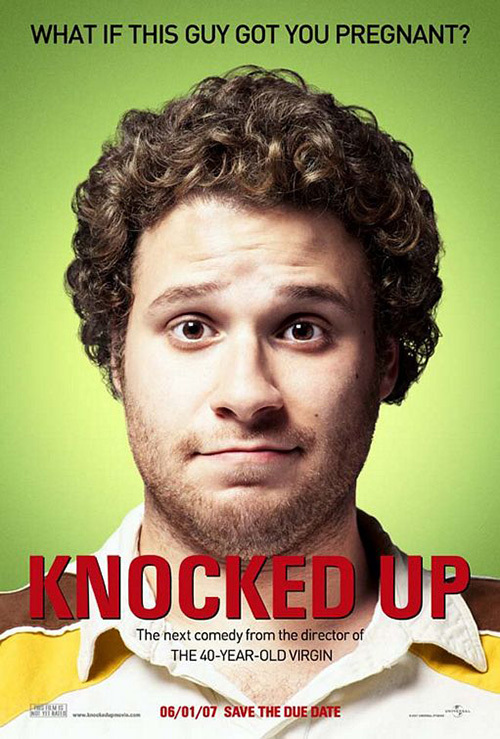 It’s not often a teaser gets outdone by the actual one-sheet, but here it is. By no means a great poster in its own right, the final poster at least plays with the edge of the page and strong contrasts to earn some intrigue. 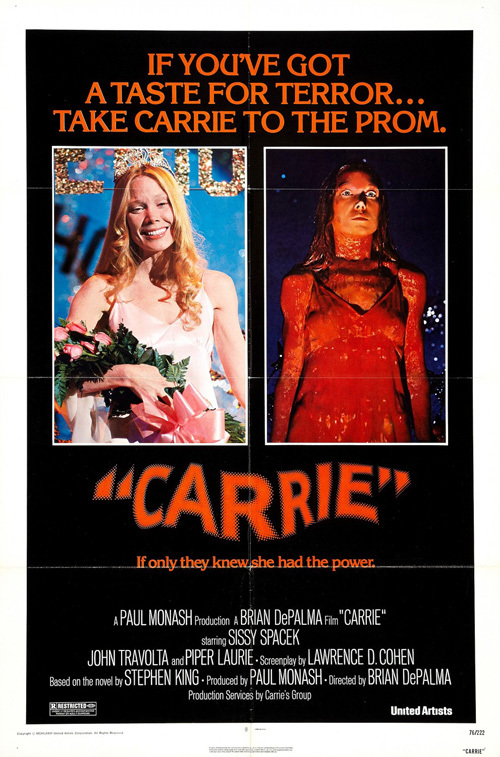 There’s something about juxtaposing Sissy Spacek’s crimson monster against the innocent prom queen she once was that these just couldn’t equal, though. 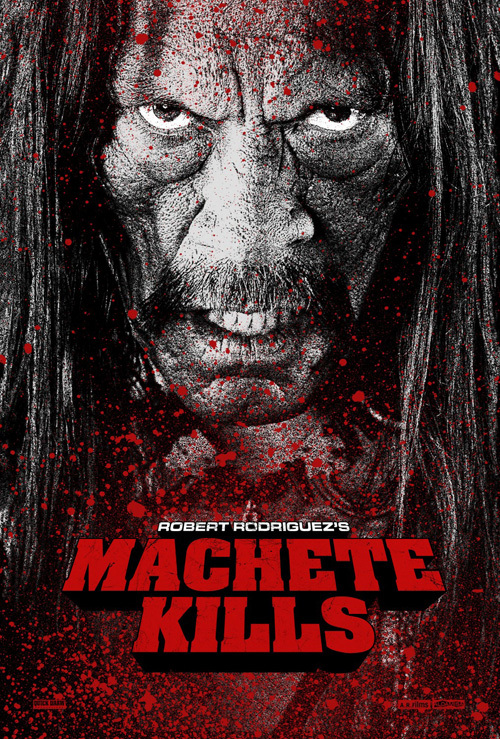 For a tease that does excel, look no farther than Troublemaker Studios’ Machete Kills (open October 11). Its black and white, grainy shot of star Danny Trejo spotted with red has the grindhouse aesthetic down pat to go with its attractively blocky logotype. 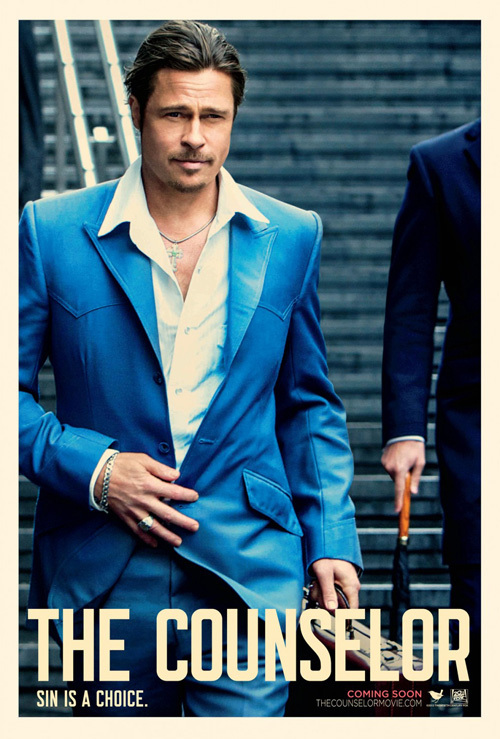 Sadly, they decided to use Rico Torres’ photography for the character posters and final sheet, mimicking what Kustom Creative did on Machete. The former are dull with flame motifs while the latter’s attempt at old school montage—with help from Ignition Print—is way too polished in comparison to the tease. Kustom at least over saturated everything to make their 2008 entry seem a bit closer to a 70s style. This new one has forgotten what the film is trying to accomplish as the carnal ferocity of the black and white is replaced by studio portraiture. Both of the aforementioned films at least tried, though. I’m not sure the same can be said for The Refinery’s A.C.O.D. (limited October 4). 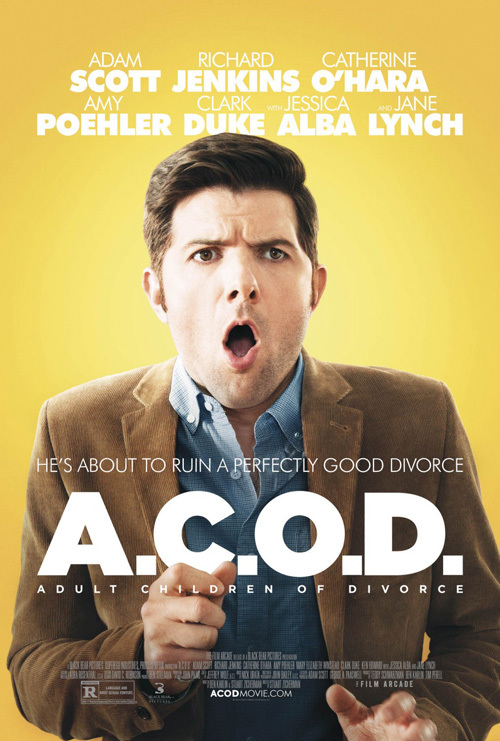 Not only does it look like they wanted to copy the feel of Crew Creative Advertising’s work on Judd Apatow’s The 40-Year Old Virgin and Knocked Up, but it’s as though they simply found a goofy still of Adam Scott, cut him out of his background, and declared themselves done. 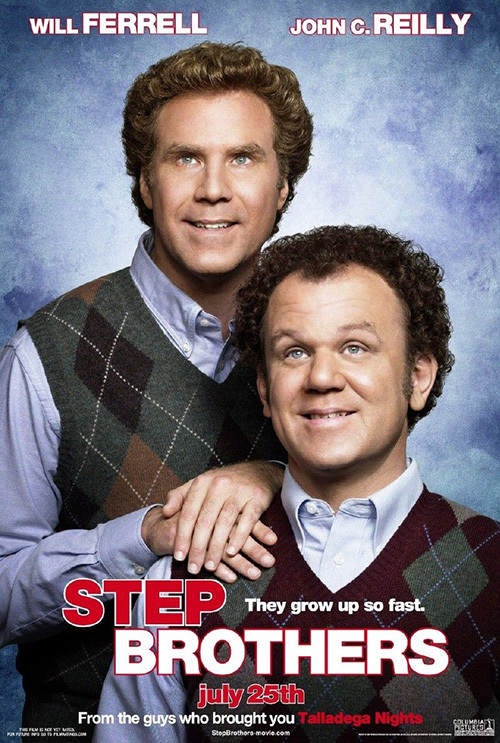 Nothing about this is tonally similar to CCA’s want for a school portrait-esque feel—a concept outdone itself by Ignition’s Step Brothers. Maybe they weren’t even trying to conjure that tone anyway, but what else they could have wanted is beyond me. And why even bother with depth tricks on the cast list at top and title name at bottom when the whole endeavor is so unavoidably flat? No reason other than laziness on the part of the studio comes to mind. 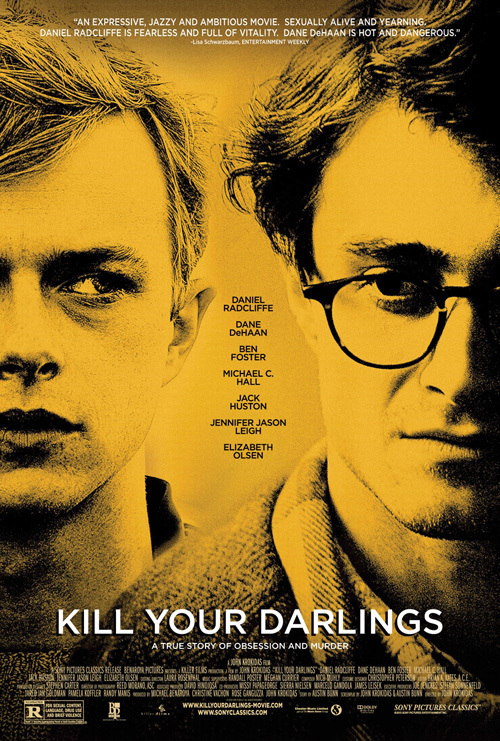 Where Cardinal Communications USA’s Kill Your Darlings (limited October 18) is concerned, the end result is just plain unattractive. 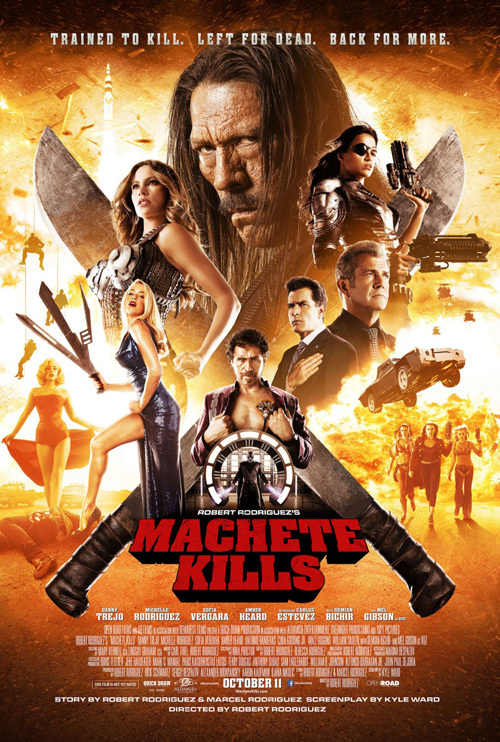 It’s as though they saw the Machete Kills tease and A.C.O.D. 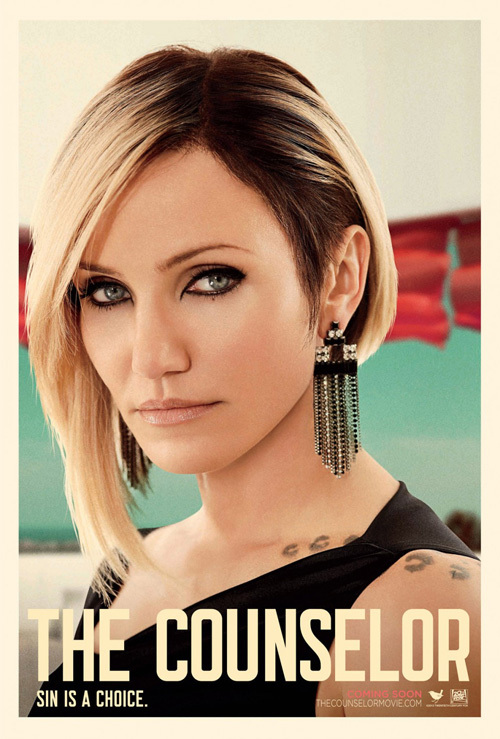 poster and wondered what would happen if they combined the two. Take a masked photo of Dane DeHaan and Daniel Radcliffe, (you can still see the fuzz from the superimposition above the latter’s right shoulder); filter them to high contrast newsprint black and white; and give them a Photoshop multiply to overlay the orange background. Voila! It actually wouldn’t be too horrible if not for the massive amounts of text. Between the novelized quote at top to the title, tagline, and footer information below, words are all you see. And the mere fact the cast names are jammed in at the center can only mean the designers separated the two actors’ heads as far as necessary to do so. The entire layout seems in response to the text when it should have been the other way around. 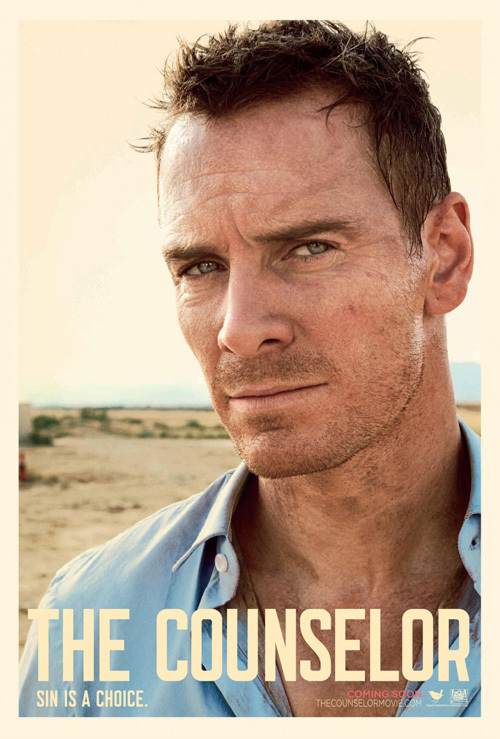 Can the text over posed actors motif die already? 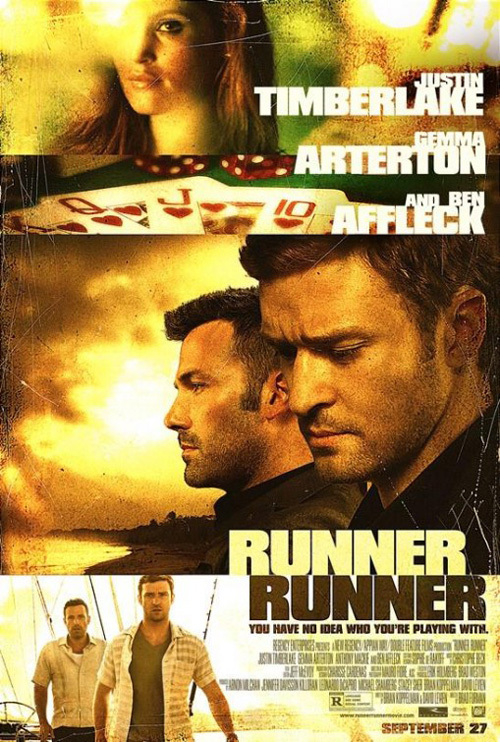 If I wasn’t irreversibly done with it before, I definitely am now after The Refinery’s adverts for Runner Runner (open October 4). 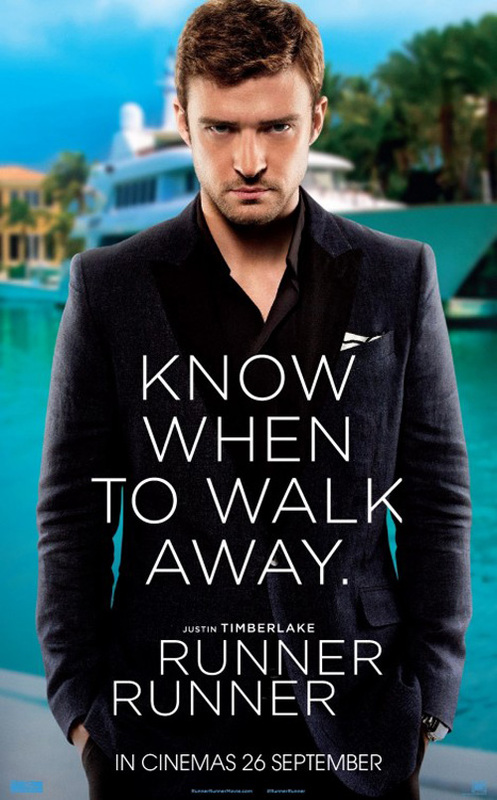 Just look at the Justin Timberlake one: the words actually hurt my eyes. They’re all displayed in an identical font and color while staying pretty much the same size—it’s too much. 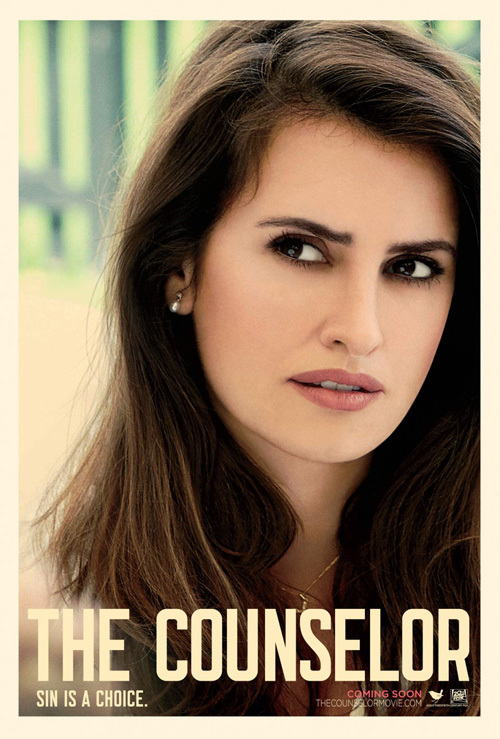 Thankfully the Gemma Arterton companion is a bit easier to decipher courtesy of her dress not being black and the copy being reduced to add space between the catchphrase and title. I don’t necessarily mind the firm’s final sheet—playing with yet another overdone motif—as the color scheme allows the ubiquitous fading faces to complement each other as they melt into one. 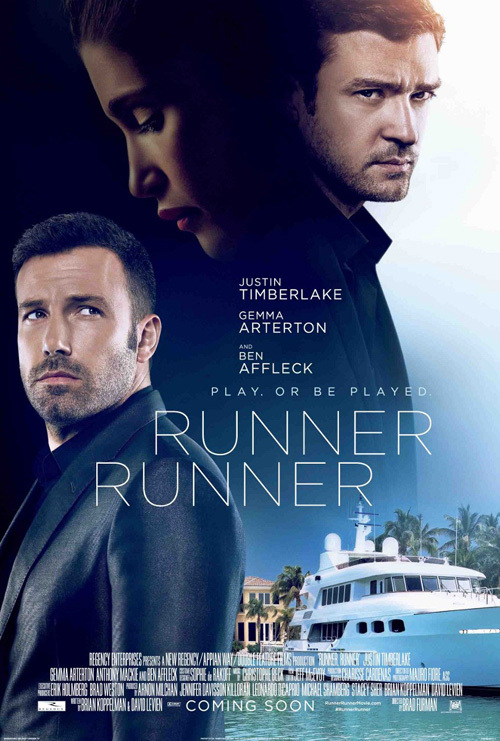 Its glaring problem, however, is the fact that the film isn’t a romantic drama wherein Ben Affleck longs to win Arterton from the clutches of Timberlake’s brooding heartthrob. With the purple hues and soft, thin text, it plays like one of those reworked movie trailers where The Shining becomes a comedy. No, despite Ignition’s boring use of the yellow filter Traffic and Breaking Bad have tricked audiences into believing designated Mexico for over a decade, you at least get the feeling this is the dramatic thriller the trailer depicts. It’s amazing what some heavy sans serif, grainy imagery, and surface scratches can do to transform The Refinery’s melancholy love into sweaty adventure. 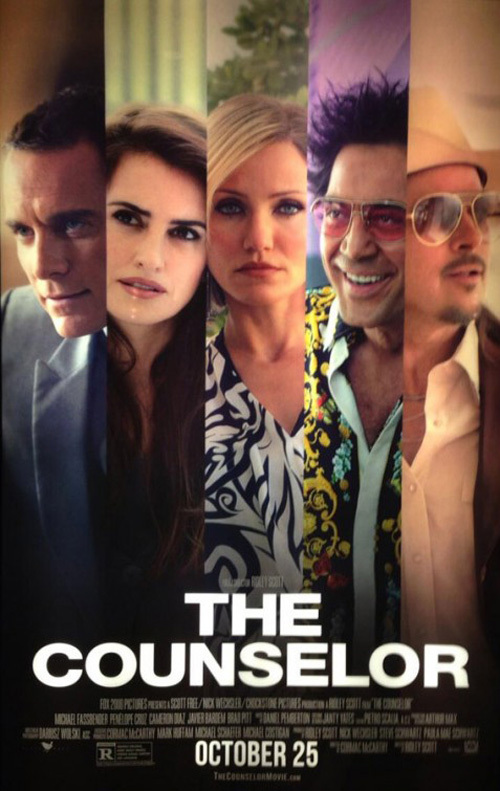 and company has no problem embracing their film’s arid destination or heavy atmosphere, however, as they use portraiture in a captivating way with The Counselor (open October 25). Ignoring Brad Pitt’s out-of-place entry, the firm nicely gives us high definition close-ups of its characters against a sandy beige hue to help complement their faces so their tans may pop. The men keep their craggy imperfections while the women acquire a blemish-free, silky smooth finish. The title and tag are afterthoughts, dwarfed by the pensive looks shot our way by the performers above them. There’s something simultaneously clean and muddy about them that the one-sheet’s colorful split screen of all cannot convey. 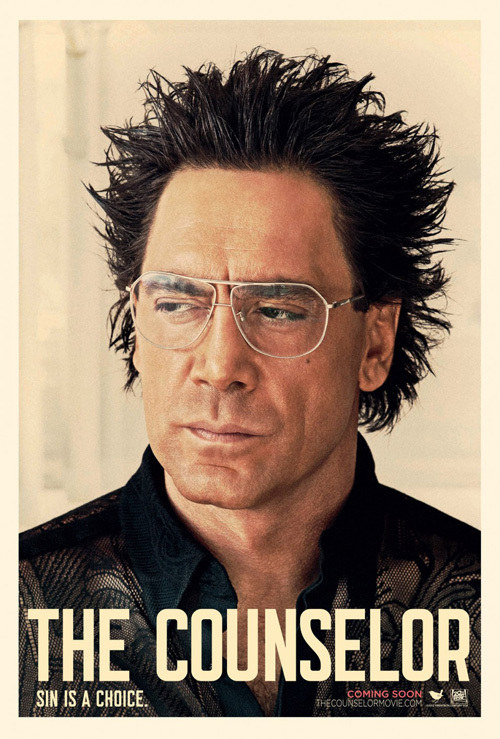 It’s the difference between serious weight and cartoonish flavor, a juxtaposition epitomized by Javier Bardem’s two iterations. While the character sheets may seem better suited for an Abercrombie and Fitch catalog, they still do their job of catching our eye so that we may wonder at what’s going on inside their minds. What is up with that Brad Pitt one, though? Does he have a contractual obligation to be seen smiling, in color, and full bodied? Just because it uses the same frame and as the rest doesn’t mean it comes close to equaling their effectiveness.